Eve Silver writes historical gothics and contemporary paranormals. Under the pseudonym Eve Kenin, she writes speculative romance. They are all excellent–you should check them out. 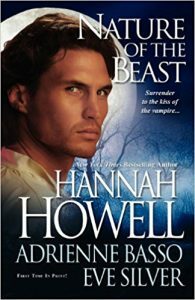 Here she gives us a sample of her vampire novella, Kiss of the Vampire, that appeared in the anthology Nature of the Beast. Swirling fog and mizzling rain settled about Sarah Lowell like a shroud, clinging to her hair and skin and clothes, a faint damp sheen. Her boots rang on the wet cobbles, her steps sure and quick, her heart beating a rhythm in time to her pace as she ducked through the dim alleys and twisting lanes, past wretched houses and tenements, and rows of windows, patched and broken. ‘Twas a dangerous route, one that carried her through the edge of St. Giles, north of Seven Dials—a route made all the more distressing by the dying moments of darkness and shadow that fought to stave off the first creeping fingers of the dawn. A part of her was attuned to the street before her, the gloomy, faintly sinister doorways, the courtyards that broke from the thoroughfare. And a part of her was ever aware of the road behind, dim and draped in fog and menace. Beneath her cloak, she closed her fist tight about her cudgel, a short, sturdy stick that saw her from point to point in the place she was forced to live. She never left her room in the lodging house in Coptic Street without it. With good reason. This was not a place for a woman alone, but she had no choice but to be here. Her choice lay in protecting herself, and that she could do, though she had neither the means, nor the inclination, to own a pistol, and she had considered—and discarded—the possibility of defending herself with a knife. So a cudgel would do, and she prayed she never found herself in a circumstance where she would be required to use it. She suspected that surprise would be one thing in her favor should her prayers go unheeded. An attacker would have no expectation that she had strength in her small frame, but then, he would have no knowledge of the years she had spent by her father’s side, honing her muscles lifting and turning patients who could not do so for themselves. With her wide hazel eyes and her straight dark hair pulled back in a knot at her nape, she had a delicate appearance that was deceiving. Her father had always said she was sturdy in both body and spirit. She wished it had not taken his death and the desperate turn of her life to prove his assertions true. A muffled sound to her left made her spin and peer down the alley next to the darkened chandler’s shop. Her heart gave a terrible lurch in her breast, and her fingers closed tight about the cudgel as she dragged it free of her cloak. With a moan, a man stumbled toward her then veered away to lean, panting, against the wall. Muttering and cursing with a drunken slur, he fumbled at the flap of his breeches. Turning away, Sarah paused but an instant to steady her nerves then walked on, willing her racing pulse to settle. Perhaps it was the cold that made her shiver, but she thought it was unease that did the deed. More nights than not she felt as though unseen eyes watched her from the gloom, footsteps dogging her every move. Now, in the early moments before dawn, it was no different. The feeling of being watched, being stalked, oozed across her skin like a slug. She never saw anyone, though she took care to look over her shoulder often. But when she looked, there was only the empty street and hollowed doorways behind her. She quickened her pace and hurried on. “Almost there now,” she murmured, with yet another glance about. She dared not relax her attention, not even for a second. Her destination was Portugal Street and the old St. Clement Danes workhouse that now housed King’s College Hospital. There was talk of a new building but, for now, there were some hundred and twenty beds split into several overcrowded wards that offered care to the sick poor. No one of wealth and means would step foot in King’s College. By choice, the rich would be seen to in their own homes, and because of it, they were more likely to survive. But the poor could not afford that luxury, and so they came to King’s College, and often enough they died. There were those who would argue that they would die regardless, and that the hospital offered some hope, however small. Sarah was inclined to favor that belief because, somehow, they did manage to save some. Still, she found it a horrific irony that King’s College was situated squarely between a crumbling graveyard and the abattoirs of Butcher’s Row, and she had her own well-guarded opinion that some doctors and surgeons here might be better suited to work in the slaughterhouses. At least there, death was the expected outcome. As the cheerless building loomed before her, she paused, glanced about once more, and a shiver chased along her spine. There, near the graveyard, she swore she saw a black-cloaked figure, painted in shades of pewter and coal and ash, clinging to the shadows. Watching. Genuine fear touched her, cold, slimy fingers that reached deep into her soul. Each night, she felt the unnerving suspicion that she was being followed, but proof of her supposition was, for the most part, absent. This was only the second time that a form had actually materialized from the mist. Or had it? She stared hard at the spot, but could not be certain she saw anything more than a man-shaped shadow. Regardless, she intended to exercise every caution. She had come early for her shift this morn, determined to vary her schedule. Tomorrow, she would vary her route, as well. Reaching the safety of the hospital, she hurried into the building and made her way first to the nurse’s cloakroom, where she divested herself of her damp over-garment, then through the dim hallways to the women’s sick ward. There was a patient here she wished to check on, a woman who was so ill she had not been able to eat or drink or even void for two days. It was as though her body refused to carry out the normal functions of life. Sarah hoped she had taken a turn for the better, though she knew in her heart that would not be the case. She paused in the hallway near the ward. The only light was the eeking dawn that filtered through grimy windows to steal across the floor in pale slashes. The sounds of suffering carried through the place, eerie moans and louder cries, a sob, the creak of a bed as someone shifted, then shifted again. Moving forward, Sarah stepped through the doorway. She dared not breathe too deeply. No matter how much limewash was slapped on the plaster, no matter how many scrubbings with yellow soap the floors took, the smell—the metallic bite of blood, the raw-onion stink of old sweat, the harsh ammonia of urine—never quite melted away. These small battles might beat back the wretched stench for a time but, in truth, the war was long lost. The sick ward was forever infused with the vestiges of human misery. Her gaze slid over the beds. Each one was full. Some even had two patients crowded into a space meant to hold only one. In the corner was the bed she sought. Little light inched that far into the gloom, and Sarah could see only the outline of pale sheets. She took a step forward, then froze with a gasp. There was someone sitting on a stool at the far side of the bed, a man, garbed all in black, the pale ghosting of the patient’s partially upraised arm a stark contrast against the dark background offered by his coat. He held the woman’s wrist. Sarah could see that now. She must have made a sound that alerted him to her presence, for he raised his head. She saw only the faint highlight of his features, so deep was the gloom that surrounded him. “Miss Lowell.” His voice reached across the space that separated them, low, pleasant, and though he was wreathed in darkness and she could see almost nothing of his face, she knew the speaker. Her pulse jolted at the realization. Neither said anything more, and Sarah remained where she was, frozen, strangely disturbed by the sight of the patient’s white forearm contrasted against the cloth of Mr. Thayne’s black-clad form. Sarah glanced about, and saw the night watch nurse curled in a corner by the fire, sleeping. She could not help but feel pity for her, a widow with three small children who, after working the day as a charwoman came to sit the night through for a shilling and her supper, leaving her little ones with a neighbor, and paying her in turn. With a sigh, Sarah turned away to tend to the patient herself. When she was done, she looked back to where she had seen the surgeon, Mr. Thayne, sitting in the darkness. University-trained physicians were addressed as Dr. apprentice trained surgeons as Mr., and there was a distinct barrier between them, not only at King’s College, but at any hospital throughout the city. He was gone, the patient asleep, her head lolled to one side, her arm hanging across the far edge of the bed. Another patient called to her. Sarah hesitated, a feeling of wariness sluicing through her. Stepping forward, she almost went to the patient Mr. Thayne had been tending. Then she wondered what she was thinking. What could she do for her that he had not? The woman was sleeping now. Best to leave her undisturbed. Again, the patient behind her called out, becoming more insistent. Sarah moved to her side and offered a sip of water, and then noting the time, she made her way to the surgical ward. Only hours later did she learn that the patient in the corner had died in the silvered moments when night turned to day, discovered by the night nurse when she roused from her slumber. Only then did Sarah hear the whispers that the woman’s wrist had been torn open, with nary a drop of blood spilled to mark the sheets. Mr. Simon, the head surgeon, determined that she had injured herself on a sharp edge of the bedstead, and in truth, they found a smear of blood there that offered some proof of the supposition. But throughout that day and well into the night, Sarah could not dispel the memory of Killian Thayne, swathed in darkness, his head bowed, and the woman’s arm so white against the black of his coat. Copyright © 2008. Eve Silver. All Rights Reserved. Hi Eve! Of the several genres that you write in, which one is your favorite, as a writer and reader? by the way great excerpt! Thanks for the excerpt. Kiss of the Vampire sounds awesome. I have Demon’s Hunger in my TBR pile, and I hope I can start reading it this weekend. I always enjoy your books. Deidre – When I’m working on a book, that story and genre is my favorite. Then I start a new project and that takes its place as my fave. One great thing about writing multiple genres is the way that it keeps me fresh. 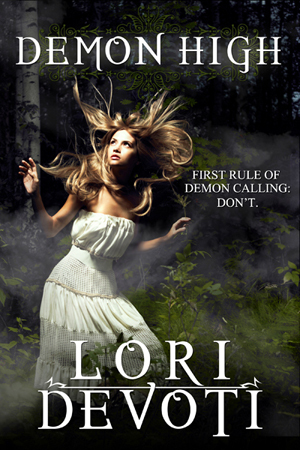 I have just read and reviewed Demon’s Hunger and it was sooo good! Demon’s Kiss was my introduction to Ms. Silver, and I became an instant fan! I have Demon’s Hunger sitting here at the top of my TBR. I would love a copy of the anthology…please pick me! Wonderful excerpt! Kiss of the Vampire sounds great! I’m adding it to my TBR pile. That was a great excerpt. I was sad when it ended. Yet another book added to my wishlist, which seems to keep growng and growing. Love your books, Eve. Have a great holiday. Oooh, what a chilling excerpt. This is definitely going on my list! Enjoyed the excerpt! Thank you for sharing it with us! Thanks for the excerpt, Eve. Good luck winning the anthology, I have it good story. And can I also recommend to you ladies Driven and Hidden by her alter-ego, Eve Kenin, love that series. Thanks for the excerpt. another one to go into my tbr stack. Ooh, great excerpt—very atmospheric! I’ve read and loved both Eve Kenin books—now the Eve Silver books are on my wish list as well! Wow Eve…your Demon books sound absolutely great and they are being added to my list which keeps growing and growing with each post I read! I already have the book, so don’t enter me in the contest, but I wanted to recommend Kiss of the Vampire. This is from a review I wrote on my blog: Eve Silver creates such a dark and dreary atmosphere you can almost hear the moans of the patients in the wards and smell the blood. The story has a somewhat spooky feeling–you know something is going to happen, and you’re sure it won’t be good! The vampire hero is wonderfully mysterious and honorable and so lonely you will want to comfort him. The heroine is brave and smart and easy to sympathize with. An excellent story and one that will leave you wanting to read more of Silver’s work. I have been waiting for the Demon book and Borders has not stocked it when I went looking last week. Hopefully it will be there now. I enjoyed reading Kiss of the Vampire and now want to go read it again while I wait for Demons. The review does describe the tension in the story. Excellent excerpt! I just read one of Eve’s books for the first time and it made me eager for more. Love the excerpt and I’ve heard great reviews on your books (I check out your books).